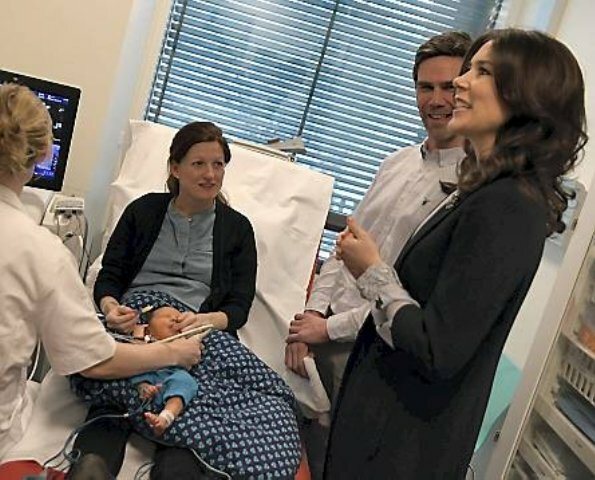 Crown Princess Mary of Denmark visited maternity wards at Rigshospitalet on January 17, 2017 in Copenhagen, Denmark. The Princess received information regarding the situation of the mothers, problems requiring urgent solutions in the maternity ward and solutions of these problems. Mary always looks well-dressed and polished but I think long sleeves under a shorter sleeved jacket work best if the sleeves underneath are close fitting. Otherwise it just doesn't look right somehow. But the colours and pattern are good. I will never understand long blouse sleeves sticking out from much shorter coat sleeves. Victoria also does this frequently. 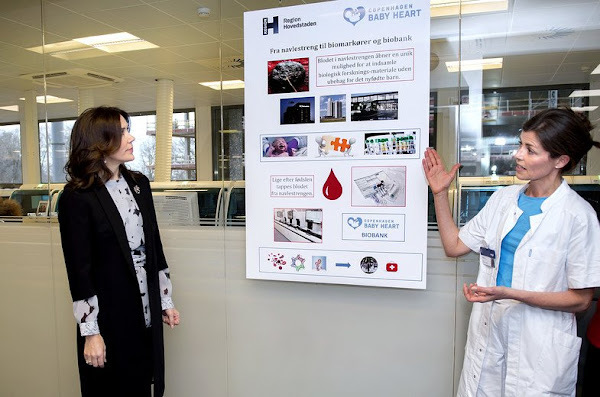 On a different note, I am not convinced at all of donating blood from the umbilical cord for research or storage in a "bank" for biological/genetic material as promoted during Mary´s visit. Am all for donating blood to save lives but not for collecting genetic material for research. Don't like the outfit. The outfit makes Mary look like a dwarf. Ein Outfit für 2 Termine. Schmale Businesshose in Schwarz, Graues gemustertes (Seiden?) Oberteil mit Gürtel und in längerer Form und als Blazerersatz der Mantel. Mir gefällt er sehr. Ich bin so froh, dass die Sachen allgemein wieder länger geschnitten werden. Interessant ist die 3/4 Armlösung. Mir gefällt es. Ein unaufgeregter Look fürs Krankenhaus. Gute Wahl.